This week the Wednesday challenge at Simon Says Stamp’s is back to school, featuring Avery Elle products. I skipped using Avery Elle products, as I only have a couple of sets that did not fit the challenge. 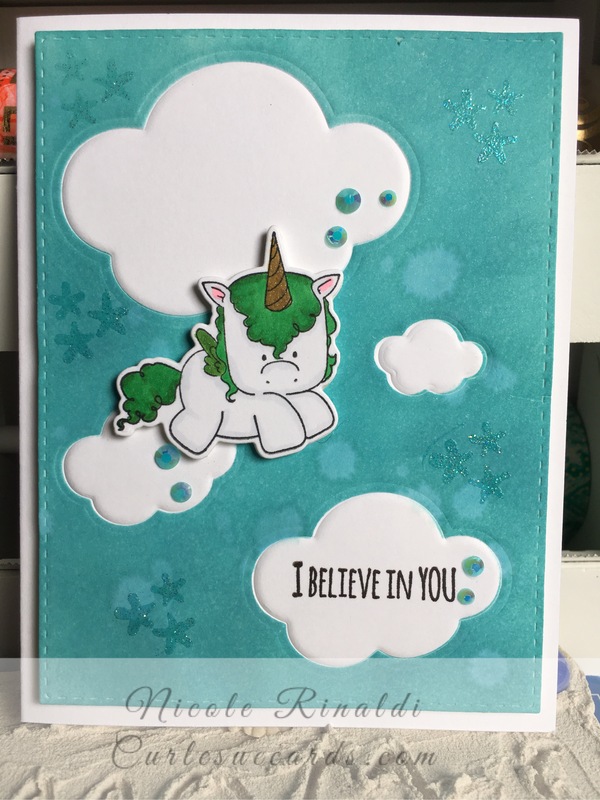 Instead I used my trusty Stamping Bella unicorns! They always come through for me! I am going to take this opportunity to admit that I am totally hooked on dry embossing using dies. I think this technique is fabulous for creating a background or a focal point. Here I used Hero Arts Clouds nesting dies to emboss several clouds on a piece of Neenah Classic Crest Solar white card stock that I had trimmed using my favorite Simon Says Stamps Stitched Rectangle Die. Then I used Inkadinkadoo’s masking paper to cut out the clouds and mask them. I covered the panel in Broken China Distress Oxide ink and sprayed it with water. After I blotted off the water I sprayed the panel with Shimmer Spray. Then I removed the mask. I added my unicorn with fun foam for dimension. I stamped the trio of stars from the stamp set in Versamark around the clouds and heat embossed with Sparkle powder. The sentiment is also from the set and is stamped with Altenew Jet Black ink. I finished the card with Lucy’s Cards jewels in pool and adhered the panel to a white card base with fun foam.